Boy Scouts young and old remember the traditional A-frame tent. For many, that tent was a Eureka Timberline. So to commemorate the Boy Scouts of America’s 100th anniversary, Eureka has upgraded the Timberline with its Timberline SQ Outfitter model. 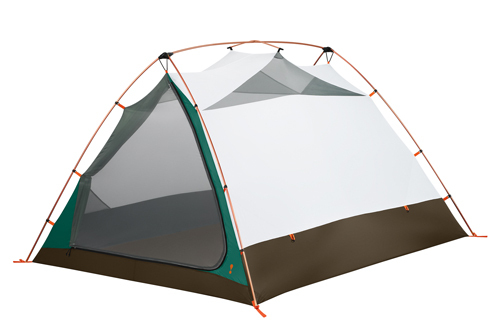 The four-person tent, slated to launch in March, uses a new frame design that increases headroom. A pole runs perpendicular to the ridge pole to help increase the tent’s living space by 24 percent, the company claims. At 9lbs, 14oz, the tent is heavy for backpacking. But when split up between four people, the weight is more manageable. Set up, it’s about 7 feet by 8.5 feet inside and 4 feet, 9 inches tall. In conjunction with the Boy Scouts’ anniversary, Eureka also created a special edition sleeping bag that’s currently available. The Eureka 100th Anniversary Sleeping Bag is a 30-degree, three-season mummy-style bag. It has ThermaShield synthetic insulation and a polyester liner with a fleece pillow pocket. The 3lb, 9oz bag is available only online through the scout catalog.